Conventional water and sewer pipes in the north are not even able to get to be buried in frost free ground. An above ground septic tank and water storage tank in an insulated shed where the pipes fun through the wall and then the basement ban be insulated without any breaks or voids. Water delivery and sump services. In the summer a fire hose above ground would deliver water to the storage tanks as roads can be soft at times. Shallow trenches that have flax straw can be uses in some acreages so that could be used for the sewage when the ground isn't frozen. Flax won't rot for 20 years. The off the grid septic system that is in 3 tanks is the best and the few pumps needed are not all that expensive is maintenance free is a concern. If they knew the dangers of sewage they would be using an outhouse as soon as the indoor one went on the blink. I think we both know the studies go to the World Bank and their medical R&D. You forgot I use facts and logic in my posts, you have your personal bigoted opinion. That didn't seem to be enough to save any of the rest of the dearly departed of the collective. If you survive here what will you do in the real world that awaits you outside. POOR STUPID MHz................you make my point for me!!!!!!!!!!!!!!!!!!!!!!!!!!!!!!!!!!!!!! THERE IS NOTHING WRONG with the design of the native housing!!!!!!!!!!!!!!!!!!!!!!!!!!!!!!!!!!!!!!!!!!! !!!!!!! The ONLY TROUBLE is sloppy work by native builders!!!!!!!!!!!!!!!!!!!!!!!!!!!!!!!!!!!!! Added to a community apathy so great that THEY DONT STOP using the broken toilet!!!!!!!!!!!!!!!!!!!!!!!!!!!! They JUST WHINE........and fill the house with SH+T!!!!!!!!!!!!!!!!!!!!!!!!!!! And idiot MHz thinks that his delusional rant about septic tanks will solve the native crisis!!!!!!!!!!!!!!!!!!!!!!!!!!!!!!!!!!!!!! AS I pointed out in my post- a white man would immediately start using a 5 gallon pail WHEN THE TOILET BROKE!!!!!!!!!!!!!!!!!!!!!!!!!! And that white man would run to the local recreation centre for access to more substantial sanitation needs WHEN TIME PERMITTED!!!!!!!!!!!!!!!!! It is SPECIFICALLY BECAUSE of imbeciles like you- MHz - that natives are in such a MESS!!!!!!!!!!!!!!! YOU ENCOURAGE THEM TO BE VICTIMS!!!!!!!!!!!!!!!!!!!!! I would encourage them to get broadband and a phone in line asking for the right instructables. Seems the Government Corrections facility was as rundown as the Government wanted the home to be. Think JT will be taking any selfies when he is the guest of honor and the Hague? That combined with the quotes of various medical professional the Government has sent would have done an inspection report for every place visited. Mold is considered a health hazard inside and outside their homes. The only inspections were the water services and all of them had boil water days so it was a flawed system from the start also and never fixed. Any idea how some Judges from Central America and East Asia would take their testimony while the Canadian Press offered not one objection. They are either both really stupid or on cahoots on the same lie. If it is illegal to do medical experiments on people in their own homes how much more is it when you have them under lock and key? Put on your INTERPOL hat before reading these. Forgot to take your pills again huh? Last edited by Christian; Nov 6th, 2018 at 04:41 PM.. Some of the posters on here, have absolutely no other interests, so maybe while they are posting on here they are leaving other people alone! Think of me as walking beside a narrow stream and trailing behind me is a long line with many hooks and they catch trolls by the jaw and yard them out of the stream. When God is the fisherman the catch are the 1/3 of all angels that have sinned. The 'many days' is the 1,000 year reign so the enemy is Satan and the remaining fallen angels at the end of the 1,000 year reign. The more he exposes the HATE he has for Jews and other westerners- the easier it is to see all that is WRONG with Our idiot Boy Justin and his loser LIE-berals!!!!!!!!!!!!!!!!!!!!!!!! Justin Trudeau’s fast-tracked Syrian refugee program may not have conducted proper background checks in some cases, a government memo obtained by the Toronto Sun reveals. The memo — dated November 2015 and compiled by civil servants in the department of Immigration, Refugee and Citizenship Canada (IRCC) — raises serious questions about the screening and vetting Syrian refugees received before coming to Canada. While the Trudeau government has maintained that proper screening precautions and security checks were taken, information in the memo suggests otherwise. This calls into question the thoroughness of the background checks conducted by the Trudeau government. Without vital information about a person, including his or her full name — with correct spelling — date of birth and gender, a background check would be futile. The fact that Syrian refugees were issued government documents with errors is deeply troubling. The internal memo — obtained through an Access to Information request and shared with the Sun — was produced by non-partisan civil servants within the federal immigration department. The memo was based on a forum held with participants from various local, provincial and federal government departments to discuss Trudeau’s 2015 election pledge to admit over 25,000 Syrian refugees in just a few short weeks. The forum was held on Nov. 28-29, 2015, in Toronto, in the midst of the turmoil of trying to implement Trudeau’s ambitious political promise. While the Liberal government eventually abandoned its initial eight-week target for Trudeau’s resettlement pledge — extending the time line by two months to Feb. 29, 2016 — the memo describes the chaos and confusion felt by those on the ground who were scrambling to implement this partisan pledge. “Participants noted that the ambitious target and time line put enormous pressure on financial and human resources,” the memo reads. While much of the feedback and recommendations from the forum amount to simply throwing more resources and more money to various government agencies for their refugee budgets, another recurring theme is clear: that Trudeau’s refugee time line was totally unmanageable. The “unexpected events” included cancelled flights, medical issues and no shows. Many experts have alleged that Trudeau’s decision to resettle 25,000 on a fast-tracked time line was based not on what’s best for Canada, but on short-term thinking and partisan gain. It was patently obvious that killer Rohinie Bisesar was severely mentally ill. So says Bisesar’s defence lawyer, Robert Karrass, who took part in a Reddit AMA (“Ask Me Anything”) Q&A session on Thursday to shed some light on mental health and the law. After two independent psychiatric assessments, he said, everyone came to the same conclusion that Bisesar could not be held criminally responsible for the stabbing death of Rosemarie Junor — an unprovoked attack on a complete stranger. Among other issues, Bisesar was experiencing “significant delusions” that control of both her body and her thoughts had been taken away. She required 10 months of treatment in a psych facility before she could even be found fit to stand trial. The lawyer spelled it out by offering his opinion on the matter, which is the same view as that taken by the law. “If a person is robbed of the ability to know what they are doing is wrong, not because they are ignoring the fact, but because a chemical imbalance in their brains prevents them from assessing their actions against societal norms, that person cannot be said to be morally blameworthy,” Karrass said. He addressed that some believe being found not criminally responsible is a ploy to avoid going to jail. Not so, he said — pointing out that very few people with mental illness engage in criminal acts, fewer still become violent, and an NCR ruling is very rare indeed and doesn’t happen without plenty of evidence. To be found not criminally responsible, Karrass said, is one of the most rare outcomes in criminal law. And you don’t go home, you go to hospital. “And it is often very difficult to obtain a release from custody,” he said. As to what will happen next to his client, Karrass said the Ontario Review Board (ORB) will decide that. The board will weigh the evidence, and if it is found that the person is a danger to society, they will be detained. That will likely be Bisesar’s fate, although Karrass said he thinks she may one day — only after the ORB has determined that she does not pose a risk to the public — be released. Could this tragic case have been avoided? Likely not. For one thing, it’s impossible to predict if someone suffering a mental illness will become violent. People cannot be treated against their will, and can only be held involuntarily if their behaviour poses a risk to themselves or others. Karrass did say, however, that the biggest challenge faced by the mentally ill is social isolation. “I think that if my client had been less socially isolated there may have been some form of intervention which could have prevented this from happening,” he said. One has to WONDER what our Cdn immigration control people thought of having this delusional and quite insane woman in their offices when she applied to enter Canada????????????????????? Oh....wait..................LIE-berals have ORDERED our immigration officers NOT TO THINK!!!!!!!!!!!!!!!!!!!!!!!!!!!! Immigration officers are NOT allowed to raise red flags over lunatics entering Canada!!!!!!!!!!!!!!!!!!!!!!!!! The Muslim Bisasar woman is a NUT!!!!!!!!!!!!!!!!!!!!!!!! The Muslim woman who attacked customers at a Cdn Tire store last year with a golf club and knife is a NUT!!!!!!!!!!!!!!!!!! The DANFORTH Ave shooter was a NUT!!!!!!!!!!!!!!!!!!!!!!!!!!!!!!!!!!!!!!!! In fact ALL the relations of the Danforth shooter are NUTS! The Muslim guy who stabbed several Cdn soldiers in a Toronto army recruiting office a few years back was NUT!!!!!!!!!!!! The Muslim guy who attacked Cdns in Edmonton a couple years back is a NUT!!!!!!!!!!!!!!!!!!!!!!! How many Muslim NUTS have we got in Canada????????????????????? WAY MORE THAN WE NEED!!!!!!!!!!!!!!!!!!!!!!!!!!!!!!!!!!!!!!!!!!!!!! !! Thank you LIE-berals for this gift of MANY LUNATICS!!!!!!!!!!!!!!!!!!!!!!!!!!!!!!!!! You are looking for a contact in Ottawa on this one. Have no fear there are 99 other threads to cover those topics. I pick on your posts because you can't say anything about getting a long reply. I thought you should know that. Oh thank you MHz!!!!!!!!!!!!!!!!!!!!!!!!!!!!!!!!!!!!!!!!!!!!!!! !!!!! I was greatly worried that you might not accept my long replies!!!!!!!!!!!!!!!!!!!! Parents were shocked when it was revealed that a number of teachers were imposing hardline Islamic values on a British city’s schools. Now, they are even more stunned that the two ringleaders are back in the classroom, the Sunday Times reports. Tahir Alam and Razwan Faraz had been banned from the profession because of their outrageous classroom behaviour. British media called the affair the “Trojan Horse Scandal.” According to the Sunday Times, Alam and Faraz were the leaders in a twisted “coordinated, deliberate and sustained action” to introduce an “intolerant and aggressive Islamic ethos” into Birmingham schools. Boys and girls were segregated. “UnIslamic” subjects like evolution were removed from the class. Secular teachers were bullied out of their positions. Alam has told media that he plans to appeal his ban, complaining that he finds hardline views “unacceptable.” However, he believes the terror attacks on 9/11 was a U.S. plot. Alam remained defiant when contacted by the Sunday Times. “Why should I speak to you about that? I am absolutely suitable for teaching any children, I have done absolutely nothing wrong,” he told the newspaper. Faraz, the deputy head of one of the Trojan Horse schools, is the brother of a convicted terrorist. He is also fighting his ban and denouncing his extremist ways. A woman who stabbed another to death in a PATH drug store will have to wait to see if she will be moved to a less-secure area at the Centre for Addiction and Mental Health. Rohinie Bisesar, 43, was found not criminally responsible for the fatal stabbing of Rosemarie Junor, a complete stranger to her, back in Dec. 2015. A court ruled Bisesar suffered from schizophrenia at the time of the murder, and was incapable of knowing that killing was legally or morally wrong. Bisesar sat motionless during a two-hour Ontario Review Board panel on Thursday, deciding whether she she be allowed — when medically deemed ready — to move from a high security ward at CAMH where she is being treated, to a general population ward where she will face less restrictions and have more privileges, such as programs and escorted passes. “She is still a significant risk,” said Dr. Ipsita, Ray, adding Bisesar hasn’t shown significant remorse and still has unrealistic view of the events leading to incarceration. Bisesar is on antipsychotic medications, but due to side effects her prescription has been altered. Ray said there is no time line to determine the results of this new drug cocktail. “We need to see the response to the medication (before any decision can be made),” Ray said. The board heard that the hospital’s recommendation to move Bisesar may be appropriate within the year before the next hearing. Board Chairman Joseph Neuberger said public safety and the management of risk will have to be taken into consideration. He said decision will be made in a week on whether to allow into the general population ward. YOU MAKE MY POINT!!!!!!!!!!!!!!!!!!!!!!!!!!!!!!!!!!!!!!!!!!!!! !!! And how odd that whenever you sober up and fly straight - lay off the LSD for a day- you end up proving my points!!!!!!!!!!!!!!!!!!!!!!!!! There is so very little about life on a typical native reserve that is either orderly or logical!!!!!!!!!!!!!!!!!!!!!!!!!!!!!!!!!!!!!!!! How is one supposed to repair a leaking sewer pipe if the nearest plumbing supply shop is a 700 KM airline flight away???????????? And how is one supposed to take initiative and deal with a leaking sewer pipe if one is a native and accustomed to blaming whites FOR ALL PROBLEMS IN LIFE?????????????????????? And how will a native- accustomed to LIE-beral coddling - find the fortitude to go out to an outhouse in the cold after a sewer pipe ruptures and dumps its nasty contents into the crawl space under the house?????????????? The problem of the native sewage house is a DIRECT RESULT of failed LIE-beral policy that is encouraging natives to think of themselves as PERPETUAL VICTIMS in CONSTANT need of rescue by whites!!!!!!!!!!!!!!!!!!!!!!!!!!!!!!!! The hard truth is that the reserves have become an anachronism that should be done away with!!!!!!!!!!!!!!!!!!!!!!!!!!!!!!!!! The reserves are no longer economically viable!!!!!!!!!!!!!!!!!!!!!!!!!!!!!!!!!!!!!!!!!!!! Once the market for native trapped furs was killed off by animal rights activists- natives no longer had any practical way to make a living out there!!!!!!!!!!!!!!!!!!!!!!!!!! Natives cannot trap furs for profit any more due to changing fashions!!!!!!!!!!!!!!!!!!!!!!!!!!!!!!!!!!!!!! Natives cannot feed themselves by hunting and fishing as in the past due to a too large population and too few animals!!!!!!!!!!!!!!!!!!!!!!! And natives scorn working and living like white people!!!!!!!!!!!!!!!!!!!!!!!!!!!!!!!!!!!!!!!!!!!! !!!!!!!! What is there left for reserve inhabitants but drugs and drinking????????????????????????? And how sad that LIE-beral policy is FACILITATING the drugging and drunkenness of natives!!!!!!!!!!!!!!!!!!!!!!!!!!!!!!!!!!!!!!!!!! Natives on the Cree Atiwapiskat reserve- population roughly 1500 souls- got $105 million dollars from tax payers and another chunk of cash- OVER $40 million in "royalties" from diamond miners at De Beers and WASTED the entire amount!!!!!!!!!!!!!!!!!!!!!!!!!!!!!!!!!! YES! $150 million dollars burned and not a single house built!!!!!!!!!!!!!!!!!!!!!!!!!!!!!!!!!!!!!!!!! And not a single receipt to show where the money went either!!!!!!!!!!!!!!!!!!!!!!!!!!!!!! Easy govt money handed to natives with NO STRINGS ATTACHED means GREAT PARTIES and mean hangovers after all the money is gone!!!!!!!!!!!!!!!!!!!!!!!!!!!!!!!!!!!!!!!!!!!!!! And LIE-berals think it is RACIST of us to expect that natives account HONESTLY for our cash!!!!!!!!!!!!!!!!!!!!!!!!!!!!!!!!!!! LIE-berals should heed the philosophers advice: "the quickest way to destroy a man is to pay him to do nothing"!!!!!!!!!!!!!!!!!!!!!!!!!!!!!!!! Apparently LIE-berals are so desperate for votes that they are willing to destroy natives!!!!!!!!!!!!!!!!!!!!!!!!!!!!!!!!!!!!!!!!!! Looks like her punishment is to be a human guinnea pig for psychotic drugs. So the doctor trying to treat her says that AFTER MANY MONTHS OF TREATMENT -"SHE IS STILL A SIGIFICANT RISK"!!!!!!!!!!!!!!!!!!!! So AGAIN LET ME ASK: how is it that LIE-beral immigration policy is so LOOSE that it can allow in so very many LUNATIC MUSLIMS?????????????? When was the last time we heard of a Sri Lankan running amok with a knife and trying to kill white "racists"????????????????? How is it that so many Muslim LOONS are trying to attack us??????????????????????? And why are LIE-berals so determined to insult us whenever we complain about the costs and blood shed??????????????????? I understand now why there are no pictures on the thread. It deserve a 'How cruel is this?' rating of some kind. The use of LSD has so addled his brains that he does not even understand what a bunch of cynical hypocrites Our idiot Boy and his loser LIE-berals are!!!!!!!!!!!!!!!!!!!!!!!!!!!!!!!!!!!!!!!!!!!! Idiot MHz does not understand that LIE-berals ARE USING Muslim voters in exactly the same way they are "CARING" for Cdn natives on reserves!!!!!!!!!!!!!!!!!!!!!!!!!!!!!!!!!!!!!!!! OTTAWA - Canada will contribute $50 million to a global charity for children's education, Prime Minister Justin Trudeau tweeted to comedian Trevor Noah, a pledge that quickly drew criticism both for its content and its form. "Hey @Trevornoah - thanks for everything you’re doing to celebrate Nelson Mandela’s legacy at the @GlblCtzn festival. Sorry I can’t be with you - but how about Canada pledges $50M to @EduCannotWait to support education for women & girls around the world? Work for you? Let’s do it," Trudeau tweeted to the South African comedian and "The Daily Show" host. Noah said "This is amazing!" as Trudeau’s tweet was shown on a big screen at the concert. Similarly, Conservative MP Michelle Rempel tweeted that Trudeau's message was "tone deaf" and also accused him of trying to get noticed by a TV star and said the money had not been budgeted for. PATH killer Rohinie Bisesar is getting a much more relaxed regimen. Notorious PATH killer Rohinie Bisesar — who was found not criminally responsible for the shocking Dec. 2015 stabbing death of newlywed Rosemarie Junor — got a gift from the justice system. Bisesar,43, is having her conditions relaxed. The ruling by the Ontario Review Board ruled that Bisesar — detained at the Secure Forensic Unit of CAMH — should have her conditions eased. The review board ordered that CAMH brass “create a program for the detention in custody and rehabilitation of the accused” within the secure unit. — Get escorted hospital and grounds privileges escorted or accompanied by staff. — Hospital and grounds privileges indirectly supervised. — Off-campus fun in Toronto, escorted or accompanied by staff. But the order stipulates that cops have to be notified and to advise them of the terms and conditions. In addition, Bisesar must “refrain from her possession any firearm, ammunition or offensive weapon.” Only a peace officer in her company can be packing a firearm. Junor, 28, was a recently married young woman when she was savagely stabbed to death during a work break when Bisesar struck. She was stabbed numerous times at a Shoppers Drug Mart in the PATH as she perused the makeup counter. Bisesar’s bloodlust lasted just 54 seconds but it was more than enough to kill the popular young woman. Nothing was said between the two women. Bisesar is a diagnosed schizophrenic but the not criminally responsible deal between the prosecution and defence has never sat well with Junor’s family. “You did it. Accept it. And then you know what I’d say? ‘I forgive you,”‘ Rosalind Junor said outside court in November. Since I am not out of my mind.............I will never have to deal with the world you inhabit!!!!!!!!!!!!!!!!!!!!!!!!!!!!!!!!!!! 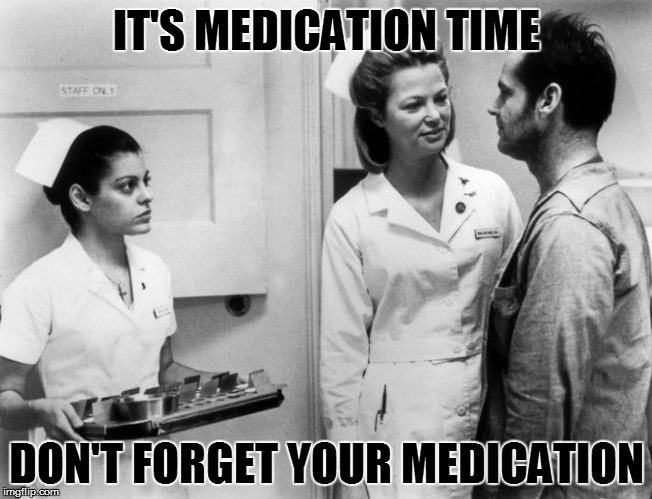 Take your meds as directed!!!!!!!!!!!!!!!!!!!!!!!!!!!!!!!!! The drugs will make you feel better!!!!!!!!!!!!!!!!!!!!!!!!!!!!!!!!!!!!! LSD IS NOT ONE OF YOUR PRESCRIBED MEDS!!!!!!!!!!!!!!!!!!!!!!!!!!!!!!!!!!!!!!!!!!!!!! !!!!! One has to wonder how quickly medical staff will abandon any real direct supervision of this lunatic killer????????? Once the guards had eaten all their fries and began to think of getting back on the road they DID become aware the guy was taking a LONG TIME..............and went in search.....................................cops found the guy a few days later!!!!!!!!!!!!!!!!!!!!!!!!!!!! And the Whitby psychiatric facility has been in trouble a few times over the years- for letting potentially dangerous nuts out for the day and then NOT BOTHERING to notify cops - as required- when the NUT does not return as expected!!!!!!!!!!! Facility spokes people seem to think it is not a big deal to have dangerous lunatics on the loose - totally unsupervised - since most of them get hungry or cold and come back eventually..............generally without harm or trouble!!!!!!!!!!!!!!!!!!! Public outcry has reduced the number of such incidents.........or maybe new LIE-beral privacy laws are simply covering it up??????? As for this crAZY mUSLIM WOMAN- SHE HAS already LAUNCHED A DEADLY ATTACK ON A TOTAl STRANGER......LIE-beral privacy laws ALLOW us to know if she does it again???????????? Or will any relapse- and subsequent new attack by this dangerous nut be covered under medical privacy laws??????????????? Rohinie Bisesar is pictured in this undated handout photo. PATH stabber Rohinie Bisesar remains a very sick woman who still has no “deep remorse” for killing a complete stranger and the MBA graduate is so delusional that she’s been been applying for jobs from her secure forensic unit at the Centre for Addiction and Mental Health. Those were some of the disturbing details found in recently-released reasons for the Ontario Review Board’s decision last month to keep Bisesar in the six-bed, highly-monitored secure unit at CAMH. While she continues to pose a “significant threat” to public safety, the board is hopeful she might recover enough over the next year that she could be moved into the general unit. More alarming is that Bisesar, 43,was actually seeking passes into the community where she’d be “indirectly supervised.” Her psychiatrist warned such unescorted visits at this time could have “catastrophic results” and the board agreed that for now, she must be accompanied off hospital grounds by staff and Toronto Police have to be notified. On Dec. 11, 2015, Bisesar was suffering from untreated schizophrenia and was actively psychotic when she plunged a knife into the heart of Rosemarie “Kim” Junor. The 28-year-old newlywed was on a break from her job as an ultrasound technician and had gone down to the Shoppers Drug Mart when she was attacked without warning. Bisesar then placed the blood-stained knife on the make-up counter and casually left Junor dying on the floor. A fixture at coffee shops in the financial district, the homeless business grad had been suffering from commanding hallucinations she kept well hidden. Bisesar was found not criminally responsible due to a mental disorder last November after she was finally declared fit to stand trial. Following her first hearing before the ORB — which is tasked with setting the least onerous conditions for people found NCR while maintaining public safety — the board has laid out some concerning details that should make it unlikely Bisesar is released any time soon. For one, she thinks she’s cured because she’s been on medication for 10 months. “Ms. Bisesar considers herself to be ready for discharge to the community at the present time, which represents a combination of limited insight and a grandiose self-appraisal, possibly as a defense mechanism, but nonetheless as an unrealistic appreciation of her circumstances,” the report warns. In further evidence of her lack of insight into her serious illness, she’s also been “actively pursuing job opportunities, both in CAMH and in the community, in spite of not having the passes to pursue same.” And even after being advised to set more realistic goals, Bisesar continues to send out applications. “This is a concerning issue when it comes to risk,” the board says. Bisesar continues to blame her illness for the attack and “does not exhibit a very deep level of remorse and sadness” for taking Junor’s life. And while she now co-operates in taking her medications as required, the board noted that in the past, Bisesar was hospitalized for her mental illness only to later refuse to take the drugs prescribed or follow up with psychiatric care. Twenty months later, Bisesar bought a knife at a dollar store and headed down to the PATH. on both immigration and mental health treatment!!!!!!!!!!!!!!!!!!!!!!! Just another Muslim LOON who should NEVER have been allowed into the country!!!!!!!!!!!!!!!!!!!!!!!!!!!!!!!!!! And no doubt the fact that she WILL NOT be hired will just fuel her sense of being discriminated against!!!!!!!!!!!!!!!!!!!!!!!!!!!! That murderous Muslim rage against Cdn "infidels" ???????????????????????? Or the Cdn conviction that Muslims ARE DANGEROUS TO OUR HEALTH???????? And here is an article explaining the best way to create Muslim Radicals!!!!!!!!!!!!!!!!!!!!!!!!!!! It’s been nearly six months since Prime Minister Justin Trudeau and Immigration Minister John McCallum rolled out their Syrian refugee program. During this time, despite all their self-congratulatory applause, not a week has gone by without some terrible news story coming out about Syrian refugees in Canada. This week’s news is perhaps most troubling. According to a CBC report quoting a Toronto non-profit organization that works with the Arab community, “every week, one Syrian woman comes forward to say she’s the victim of domestic abuse.” Every week, in Toronto alone. And that’s just the women who come forward. Many refugees in violent relationships will suffer in silence. While domestic violence happens everywhere, in some parts of the world it may be considered permissible to abuse one’s wife and children. Anger and violence may be a part of everyday life. But that behaviour isn’t welcome, or allowed, in Canada. We should have been, and should be, unequivocal on this point. We should have told every refugee coming into Canada that cowardly practices like domestic abuse are illegal and not tolerated here. Instead, the Trudeau government rushed to bring over Syrian families, including, clearly, some men prone to domestic violence, without asking if they could adapt to our society. When it comes to refugee resettlement, Trudeau’s policy is actually preventing many Canadians from volunteering and helping Syrian newcomers integrate into our society. Naomi Buck, a freelance writer featured in the Globe and Mail this week, worked with her neighbours in Toronto to raise over $50,000 for Syrian refugees. They jumped over all the bureaucratic hurdles to qualify for private sponsorship. But now, six months after they submitted their application, the Syrian family Buck was matched with has still not arrived in Canada. This is a common story across the country. Volunteer groups are paying rent on empty apartments because the refugees they sponsored are stuck overseas. Meanwhile, some refugees that are here — mostly brought through the government sponsorship program – are also being neglected. While waiting for her matched family to arrive in Canada, Buck began volunteering with a government-sponsored family. She was saddened by the way these refugees were living. As she wrote in the Globe, the family spoke no English, had no food, no medicine and very little furniture in their apartment. Rather than being aided by a government resettlement agency, Buck discovered this family didn’t even have a contact number for their case worker. Basically, they’d been abandoned. Buck’s group enrolled the family in language school and the children in summer camp. They brought the family to a food bank, library, shopping mall and doctor’s office. They donated household items, helped pay bills and assisted one family member in getting a job at a local restaurant. This is the important and invaluable role that volunteers like Buck play. But instead of helping Canadians and matching refugees with volunteers, McCallum and Trudeau stubbornly continue to prioritize refugees under their flawed government sponsorship program. For Trudeau, it is not a question of how many refugees we can reasonably resettle. He has decided it will be 50,000. But when it comes to the way these refugees integrate, the quality of life they have in Canada and whether they truly become Canadian, the Trudeau government is missing in action. Trudeau can brag about his refugee program on the world stage all he wants. At home, it’s becoming clear he’s letting many Syrian refugees down.